I noticed that I am approaching two years of the Read The World challenge. So it seems worth pausing to take stock. Alright, I think. Having started with 36 countries already ticked off, I’m now on 89. So that’s 53 books in two years, at a rate of about one a fortnight… which is respectable enough. At this rate it’ll take me another four years to finish, which is slightly intimidating, but there’s no particular hurry. I started pretty much on a whim, so it’s a success of a sort that I’m still going after two years without having got bored or sidetracked enough to quietly let the project die. There have been some occasions when it got close — I was going pretty slowly at the start of this year — but I think the trick is to always have several new books lined up at any time, so I have some choice. Since, as I said, I really got into this without any planning or forethought — Julie posted a link to it and I thought, oh, that sounds kind of fun — it’s worth asking why I’m still doing it, what I think the point is. The main value, for me, is simply that it has made me read a lot of books I wouldn’t otherwise have found. Some of them I might have read — mainstream successes like The Kite Runner or established classics like The Maias. Others I would never have read without the challenge, like an anthology of Eritrean poetry, or a book about the architecture of the St Vincent and the Grenadines. Most fall somewhere in between; fairly conventional literary works in translation from specialist publishers: university presses, small presses, publishers aiming at the academic or educational market. One positive effect is that I’ve been reading a lot more fiction: I was in a bit of a non-fiction rut. And I’ve been enjoying it, although I find I’m increasingly impatient with mediocre fiction. I can usually cope with non-fiction, even if it’s a bit dry; I take a pseudo-scholarly attitude and just plough through it, finding interest where I can. But badly written literary prose annoys the hell out of me. So, am I learning all about the WORLD? Well, yes, the books touch on lots of topics and places and cultures I don’t know much about, and hopefully some of that interesting new information stays with me. And clearly that’s part of the point, that this is an exercise in literary tourism. But I don’t want to burden these books with the responsibility of single-handedly representing a whole country, and I don’t want to pigeonhole the authors too much. It’s a bit like real tourism: you don’t want to be the guy who goes on a one week safari and comes back thinking he has a new and profound understanding of Africa. One virtue of using ‘author born in the country’ as my main criterion is that it’s quite strict but it’s also essentially arbitrary. It doesn’t necessarily imply typical or representative. All else being equal, I tend to go for books which have a clear connection to the country; but enjoyable and interesting are much more important qualities than typical. So my book from Croatia is by a woman who actively rejects the Croat identity; the one from Kyrgyzstan is set in Kazakhstan; the one from Togo is mainly about Greenland; the one from Azerbaijan is about chess. It doesn’t matter. If anything, because this exercise involves reading a lot of post-colonial literature, I’ve read a few too many politically-driven novels which attempt to tell the story of a whole country; usually in microcosm via the life of one representative village. Sometimes that can be brilliantly successful, but often it’s the narrower, quirkier books that are more engaging. Although this exercise theoretically covers the whole world, it is wildy unrepresentative of the world’s population. Parts of the world with many small countries, like the Gulf States, the Pacific, the Caribbean and West Africa, gain exaggerated importance; large countries get sold short. If my 200 books were distributed by population, I would need to read 6.79bn/200 = 1 book for every 34m people. India and China have populations of over a billion people each; so it would be a frankly startling 39 books for China and 35 for India. Chaka by Thomas Mofolo. Lesotho. An unexpectedly powerful novel from 1925 about Shaka, the Zulu warrior king. The Culture of Lies by Dubravka Ugrešić. Croatia. Essays about living in Yugoslavia as it falls apart around her. It’s particularly striking on the instant rewriting of history. Across Arctic America by Knud Rasmussen. Greenland. Arctic exploration. A combination of Boy’s Own adventure story and some fascinating anthropology. The Maias by José Maria de Eça de Queiroz. Portugal. A proper big fat C19th century novel about the romantic entanglements of wealthy, mildly bohemian society types. How the Soldier Repairs the Gramophone by Saša Stanišić. Bosnia and Herzegovina. A funny, sad postmodern novel about the war in Yugoslavia. The Day Lasts More than a Hundred Years by Chingiz Aitmatov. Kyrgyzstan. One of the most striking novels I’ve read for a long time; a Soviet novel set out in bleak, remote steppes of Central Asia, with a bizarre science fiction subplot. Rivers of Babylon by Peter Pišťanek. Slovakia. A grotesque satirical novel set in a hotel in Bratislava in the aftermath of the collapse of communism. Dark and funny and full of fizz. Independent People by Halldor Laxness. Gloomy gloomy Iceland. Don’t Let’s Go to the Dogs Tonight by Alexandra Fuller. Zimbabwe. A funny, moving memoir of growing up as a white farmer in southern Africa at a time when that way of life is clearly falling apart. An African in Greenland by Tete-Michel Kpomassie. Togo. Fascinating for the insights into the traditional way of life in Greenland. Includes some truly revolting-sounding foodstuffs. Broken Glass by Alain Mabanckou. Congo. A drunkard who hangs around a bar in Brazzaville tells his story. Clever, funny, moving. 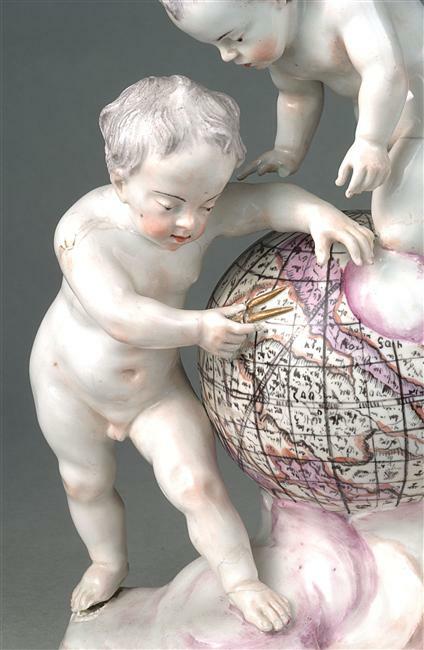 » The picture is a detail of a porcelain group from the Frankenthal factory. Hello! I’m on the same mission as you, glad to see the literary world is being explored by other cerebral travelers! Thanks for publishing your recommendations, I’ll definitely take you up on a few. Good luck on your adventure!